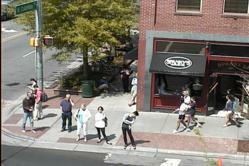 TrueLook announces a new webcam sitting over Chapel Hill's historic Franklin Street, letting web users view the home of the UNC Tar Heels. There’s a new eye in the sky over college town Chapel Hill, home of the North Carolina Tar Heels. An interactive webcam now sits above the corner of Franklin and Columbia streets, providing live shots of the iconic social hub. Anyone with internet access can view the live webcam, check out the college scene, and view the historic main street of perhaps the oldest public school in the United States. The camera is owned by Raleigh-based television station WRAL, and now looks down from the roof of the Top of the Hill restaurant. The station had previously placed a webcam at this same location in late 1999, and dubbed it the “Robocam.” Now, over a decade later, Robocam has returned, but with a few more bells and whistles. An unlimited number of users can simultaneously access and control the camera, aiming it in any direction and zooming in and out. If you’re standing on Franklin Street, refrain from picking your nose because webcam viewers can also save images the camera’s online photo album – along with comments. The webcam interface also allows images to easily be shared via email, or posted to Facebook or Twitter. The webcam is also preset to create time-lapse videos by taking snapshots at regular time intervals. This should provide an interesting way to watch the street activity in high-speed, but will also make the Franklin Street celebrations a bit more interesting. Halloween usually sees between 40,000-80,000 costumed locals crowd the streets, and many UNC sports victories have turned into a celebratory ruckus on Franklin. The webcam is freely accessible via the WRAL website, and is powered by TrueLook, a leader in interactive webcam technology based out of Winston-Salem, NC. TrueLook technology powers webcams at many popular destinations around the world, and is also used heavily in the construction industry for time-lapsing and remote jobsite monitoring.